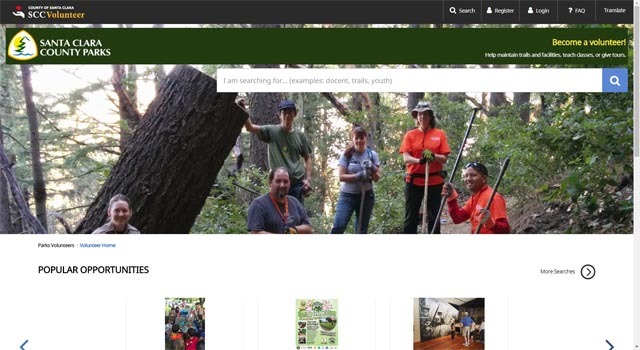 Welcome to the New Almaden Quicksilver County Park Association (NAQCPA) website. Our purpose is to promote the educational and interpretive activities of the Santa Clara County Parks and Recreation Department, particularly in Almaden Quicksilver County Park. See below for information about NAQCPA, our past and present activities, and how you can join or help with the park. Also below is information about Almaden Quicksilver County Park, maps, trail descriptions, and park events. See the links on the side for related websites. 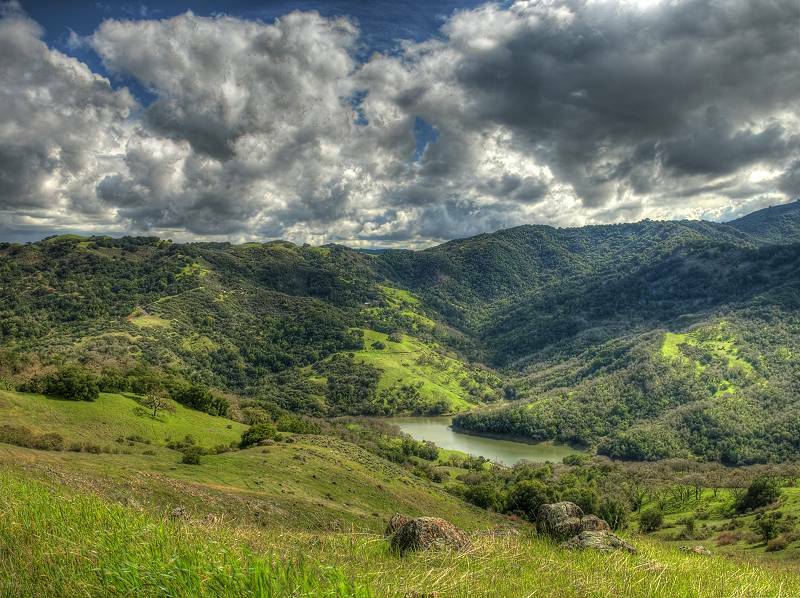 The County Parks' newest #PixInParks Challenge includes a route in Almaden Quicksilver County Park. It starts at the Wood Road Trail (picture above) and makes a loop around Mine Hill on the Castillero and Mine Hill Trails, before returning on the Wood Road Trail. Points of interest along the way include the Mine Hill Rotary Furnace, English Camp, the San Cristobal Mine, and Bull Run. It follows the same route as this Healthy Trails hike in 2009. There was a CNPS/Open Space Authority plant hike at Almaden Quicksilver on 1/14/18. Docents and plant experts led a hike up the English Camp Trail to English Camp, then went down the Deep Gulch Trail. Here are pictures from the hike. 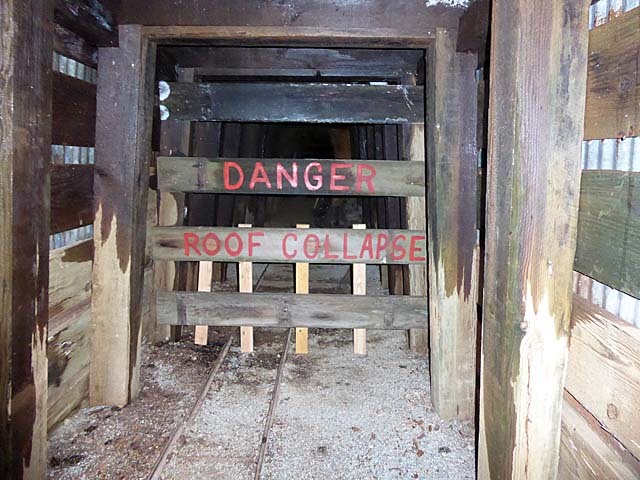 Taken on 1/21/18: The San Cristobal Mine, which had a fence at the opening due to a landslide-caused roof collapse deep in the tunnel (see picture from 8/7/17 above), is now open partway. Boards block access to the area beyond, which has the collapsed roof. 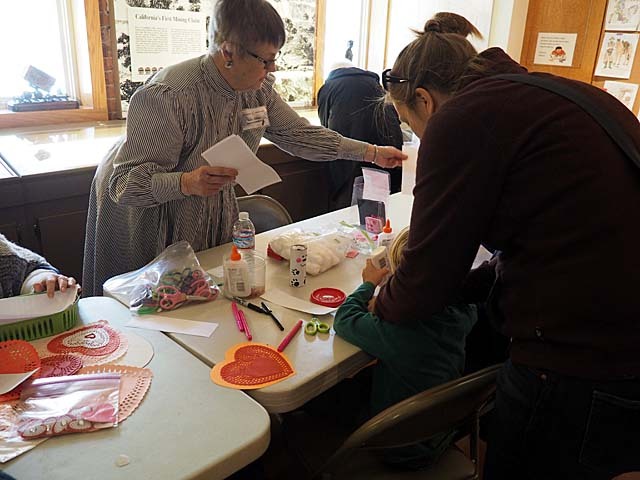 Living History Day was held at the Casa Grande on 2/11/18. There were Valentine's Day crafts for kids. Julie Lee, manager of the County Parks' Volunteer Program sent out a letter announcing the new County-wide Samaritan volunteer management system. She also sent out a "how to" guide with a FAQs section. Volunteers will be using the system to enter their hours and can search for volunteer opportunities. There will be training sessions announced. Here is the link to Samaritan. Almaden Quicksilver County Park has a new neighbor: the 966-acre Rancho San Vicente addtion to Calero County Park, which opened on 3/24/18. (See Rancho San Vicente Opening Day, 3/24/18.) The main entrance and parking lot is on McKean Road opposite Fortini Road, which leads to the Stile Ranch/Fortini entrance of Santa Teresa County Park. There is a neighborhood entrance on Almaden Road, on the other side of the street from 20491. There is no parking lot there, only limited street parking. It is a long way from the entrances to Almaden Quicksilver trailheads at the moment. It is approximately halfway between the Mockingbird Hill Lane and Hacienda entrances at Almaden Quicksilver, though there is talk of someday opening another entrance near the bridge on north Bertram Road. At the Almaden Road entrance, there is this bridge above, which leads across Alamitos Creek to the new Almaden Trail in Rancho San Vicente. Here are pictures of this entrance and trail: Rancho San Vicente Almaden Road Entrance, 3/25/18. The County Parks has a new interactive webpage showing the best trails for viewing wildflowers in the parks. Three of the featured trails are in Almaden Quicksilver: the Senador Mine Trail, the Castillero Trail, and the New Almaden Trail. 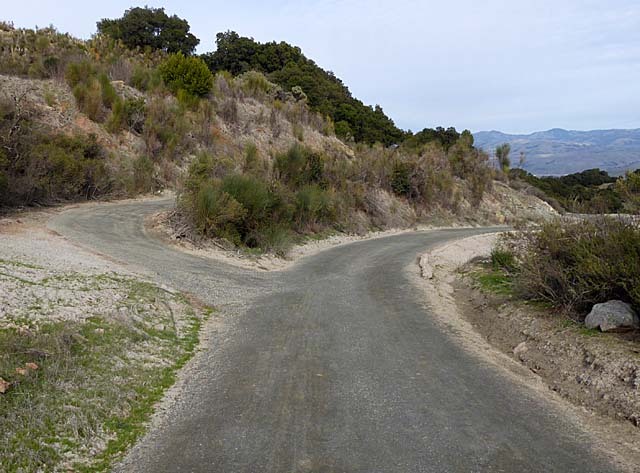 Two of the featured trails are in Santa Teresa Park: the Rocky Ridge Trail and the Stile Ranch Trail. Another is nearby in Calero (Rancho San Vicente). You can also download a printed wildflower guide. 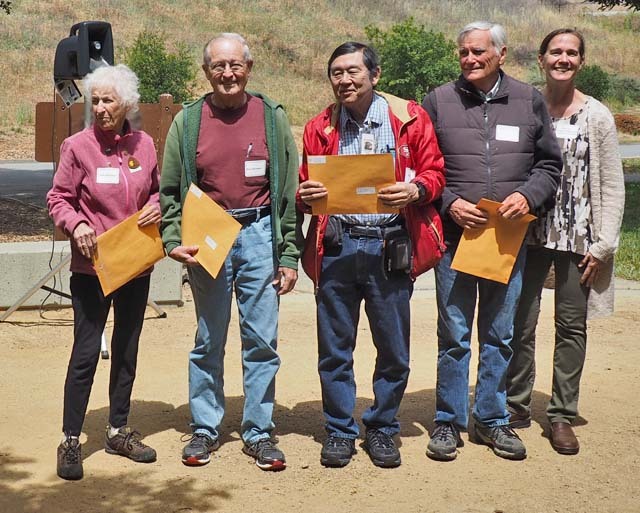 Here 3 NAQCPA and FOSTP (Friends of Santa Teresa Park) members are receiving lifetime volunteer service awards (left to right): 13,500 hours for NAQCPA President and FOSTP Vice President Kitty Monahan, 28,500 hours for Grant Park docent Ron Bricmont, 11,000 hours for NAQCPA Webmaster and FOSTP Secretary Ron Horii, and 8,000 hours for NAQCPA Board Member and FOSTP President Mike Boulland. Volunteer Program Manager Julie Lee is on the right. Here are pictures from the Volunteer Recognition Event at Hellyer County Park. 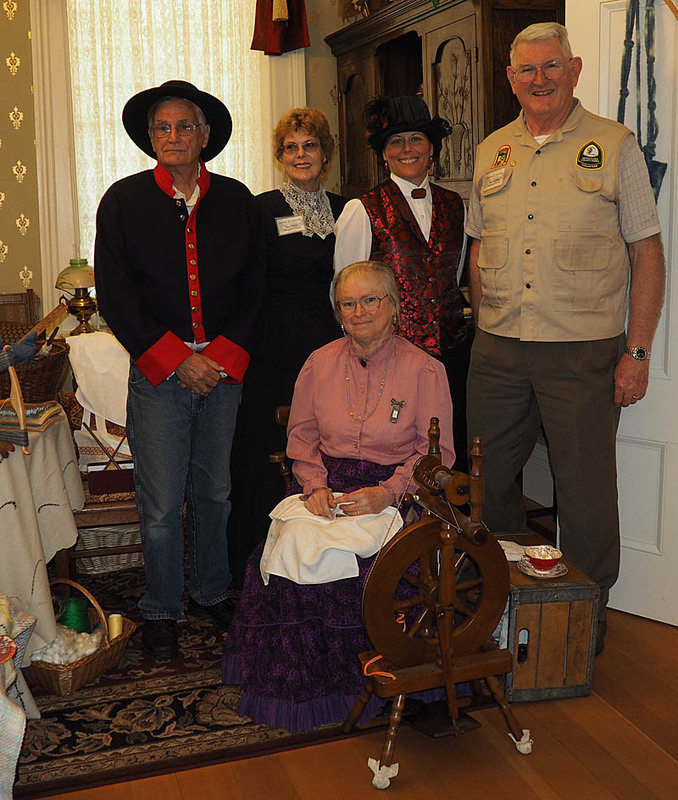 Living History Day was held at the Casa Grande on 5/6/18. Helping out were (clockwise from the top) Docent Doug, Park Interpreters Natasha, Chris, & Kelsi. See here for more pictures from this event. Play Like a Miner will be held at the Casa Grande on July 21, 2018 from 11 am to 3 pm. Join in for a fun day of learning what it was like to be a miner long ago. There will be games, demonstrations and crafts as well as an opportunity to try your hand at panning for gold and precious gems.A fun event for the whole family. Here are pictures from last year's Play Like a Miner. The Parks For Life Challenge is a FREE game that is hosted by the Santa Clara County Parks and Recreation Department to help you and your friends and family get outside and engage in healthy activities in our lovely 48,000 acre park system. Teams of 2 to 3 players sign up, and then choose to participate in outdoor adventures in any one of our 28 regional parks. Document your adventures by posting photos or videos on your social media sites to compete for awesome prizes. For more details and to sign up, see here. Play LIke a Miner was held at the Casa Grande on July 21, 2018. New this year was this simulated mine tunnel, which wrapped around the Blacksmith Shop. Visitors wore miners' helmets with lights to explore the tunnel, guided by volunteers. In the tunnel were mining pictures and artifacts. See here for pictures of the event, volunteers and staff, and geology exhibit. 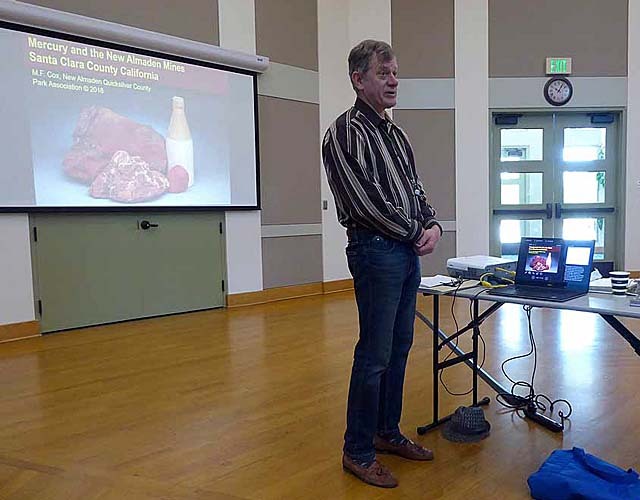 On August 15, 2018, geologist, historian, and NAQCPA co-founder Michael Cox gave a talk about the New Almaden Mines at the Morgan Hill Community and Cultural Center, 1700 Monterey Road, Morgan Hill, CA. There's a new 6-minute video, narrated by Doug McConnell, highlighting Santa Clara County Park's legacy of providing outstanding recreational opportunities in beautiful natural locations. Features include nature, historical sites, outdoor recreation, and the people behind parks. It features many of the County Parks, including Santa Teresa, Hellyer, Calero, Martial Cottle, and Almaden Quicksilver. On September 6-7, 2018, there were visitor services training classes at the Casa Grande for County Parks hosts and docents. The first session, which was required for both hosts and docents, covered "informal interpretation including an overview of the parks system and mission, expectations, customer service, personal and visitor safety, etc." The second and third sessions, which were only required for docents, covered "interpretive themes and goals, methods and practice, group management skills, and creating and supporting audience centered experiences." More classes will be offered in the future for those who missed these. There are many volunteer opportunities for visitor center hosts and school program docents. On 9/8/18, the annual New Almaden Day Jump-In Parade was held, but with some changes. The bridge over Los Alamitos Creek at the north end of town was closed for construction, though construction hasn't begun yet. The parade could not go down Bertram Road as usual, starting at the New Almaden Community Center. Instead, it started at Almaden Quicksilver's Hacienda staging area, went down Almaden Road, turned around at the Casa Grande, and came back on Almaden Road. Here are pictures of the parade preparations, the parade going north on Almaden Road, the parade returning south on Almaden Road, and the carnival after the parade at the Community Center. On Saturday, October 13, 2018, Pioneer Day was held at the Hacienda Outdoor Mining Museum. We celebrated the work to replace the interpretive signs at the Outdoor Museum. Here, Rich Robertson (left) and Bruce Bartlett (center) talk about the effort. Art Bouldreault (right) was the emcee at the event. Here are pictures from Pioneer Day. 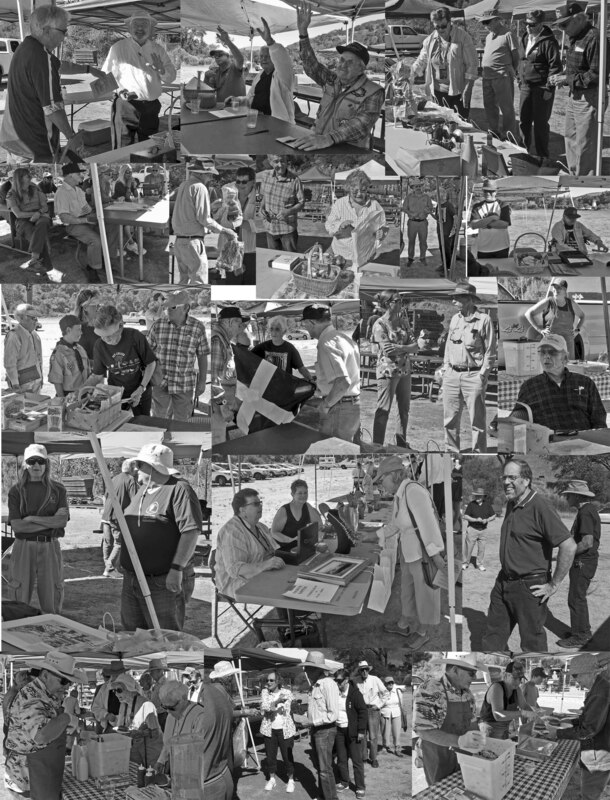 Here are black and white collages from Pioneer Day, made for the newsletter: Page 1, Page 2. Ron Horii had an exhibit at the Campbell Library in downtown Campbell from 2/1 to 2/28/19. It was based on his 2011 exhibition at the Santa Teresa Library. 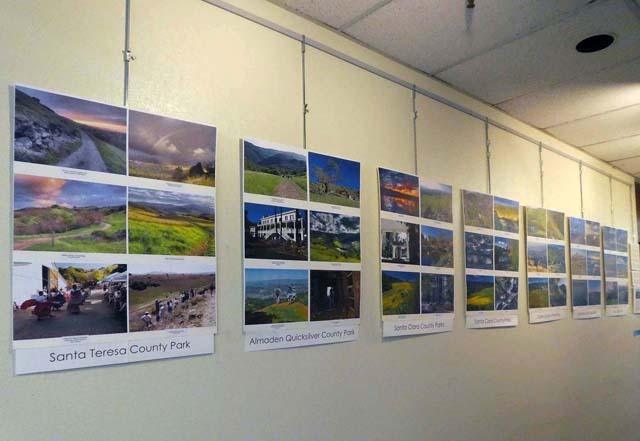 He had posters with pictures of Santa Teresa County Park, Almaden Quicksilver County Park, other County Parks, open space preserves, San Francisco Bay parks, and San Jose parks. Here is an album showing the exhibition. 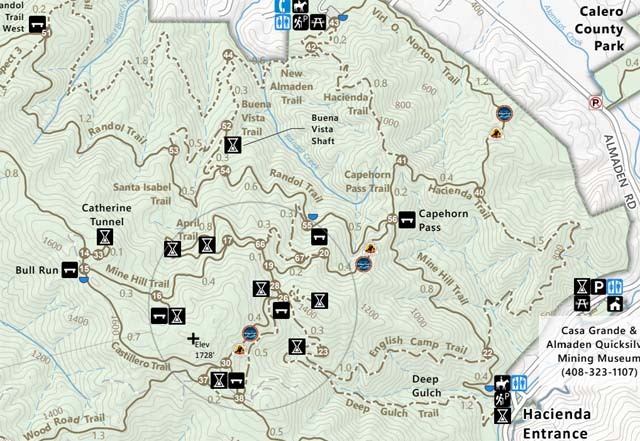 A new map is available for Almaden Quicsilver County Park. Maps are being updated for all the County Parks. They show numbers at every trail junction. Trail signs will have those numbers on them eventually. The idea is that problems can be reported by listing the nearest trail junction numbers. NAQCPA was originally incorporated in 1984 and is the oldest and largest Santa Clara County Park friends organization. If you are interested in finding out more about Almaden Quicksilver County Park or want to help with our projects, you are invited to join NAQCPA. You will receive our newsletters and invitations to our events, such as Pioneer Day. Dues are used to pay for the newsletter and our projects. Print out and mail this form for sending in membership dues and donations, which are tax-deductible. See below for more information about donations, including donating online. NAQCPA accepts donations of time, effort, artifacts and money. At NAQCPA, our most valuable resources are the time and effort of volunteers to help with various projects. Since NAQCPA is a not-for-profit 501c3 corporation recognized by the state of California and the IRS, donations may qualify to be tax-deductible depending on your circumstances. To donate time as a museum docent, to walk students around the community, as an archives recorder, to clean up trails etc., call Kitty Monahan at 408-268-6541 or the park interpreters at the New Almaden Mining Museum, 408-323-1107. If you have photos, books, magazine articles or other artifacts from or about New Almaden that you want preserved for future generations, please consider donating them to NAQCPA for use in the archives and in the museum. You will receive a receipt that identifies its value for IRS Tax deductibility purposes. To donate these items, call Kitty Monahan at 408-268-6541 or the Santa Clara County park interpreters at the New Almaden Mining Museum, 408-323-1107, or bring them to the museum during visiting hours. 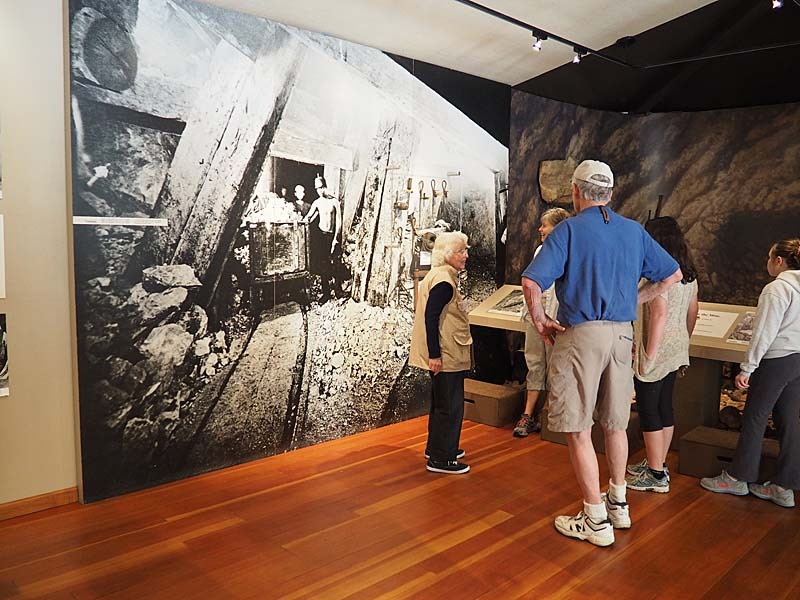 Click here for visitor information about Almaden Quicksilver County Park These pages, created by Ron Horii, have park pictures, trail descriptions, information about the New Almaden Quicksilver Mining Museum, and related links. If you live in or near the Santa Clara Valley or Silicon Valley in Northern California or are planning a trip to the area, you may enjoy a visit to the New Almaden Quicksilver County Park. Come and see our beautiful park and learn about its wildlife, and many historic photographs, writings, relics, and landmarks. You can reach the park office at (408) 268-3883. Many NAQCPA members serve as docents in the museum, giving guided tours. There are frequent events at the Casa Grande, such as Living History Days, Play Like a Miner, a yuletide bazaar, and historical talks. See the events calendar below. The grounds are also available for rent for special occasions, such as weddings, parties, and company picnics. See Ron Horii's picture and description of the Casa Grande for the Visual San Jose 2015 Photo Contest. The Casa Grande has a bookstore and gift shop. 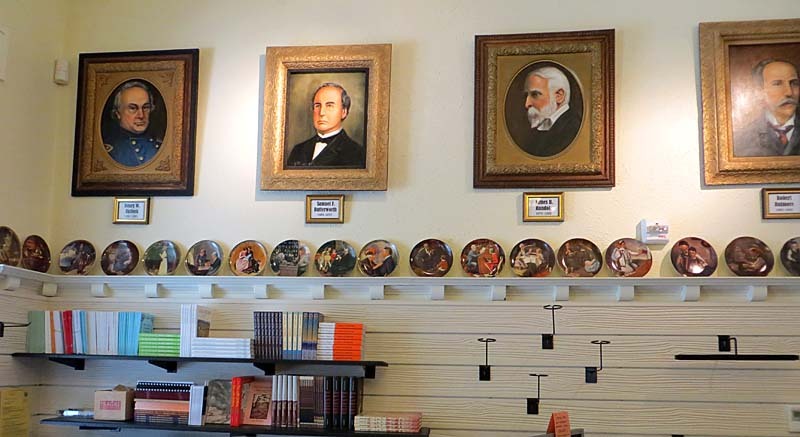 It is decorated with historic portraits. 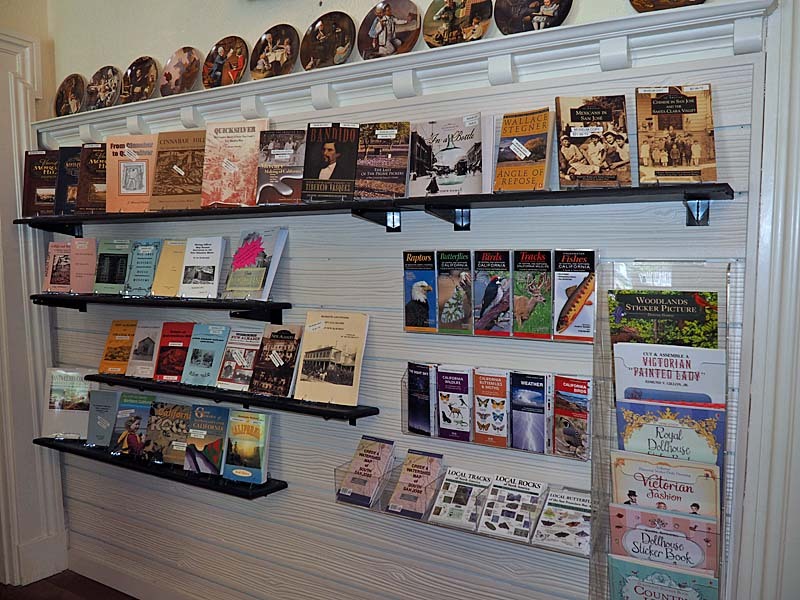 For sale are books on history, minerals, flowers, wildlife, and children's activities. They also have maps, nature guides, colorful rocks, jewelry, educational toys, and artwork. Some of the publications available in the store were written by NAQCPA members. Books are for sale in the gift shop. This yard, at the former site of the Hacienda Reduction Works, contains a collection of equipment from the New Almaden Mine and the Guadalupe mine. One item of particular interest is an old wooden Cornish pump from an English design which was used to pump water out of the mine shafts. Another unusual item, a cylindrical piece of machinery, was a small rotary furnace used for extracting Mercury from crushed cinnabar ore. This is a more recent picture from the archives, taken in 1952. The Casa Grande and its grounds were used for a resort called Club Almaden. There was a swimming pool in back. For years, there was an unorganized collection of rusting mining equipment sitting behind a fence in the Hacienda area of Almaden Quicksilver near the Deep Gulch Trail entrance. Above is how it looked in 2008. NAQCPA members, led by Bruce Bartlett (above), organized, repaired, and re-arranged the equipment and added other mining equipment. They had interpretive signs made, paid for the fencing, and created life-size figures. 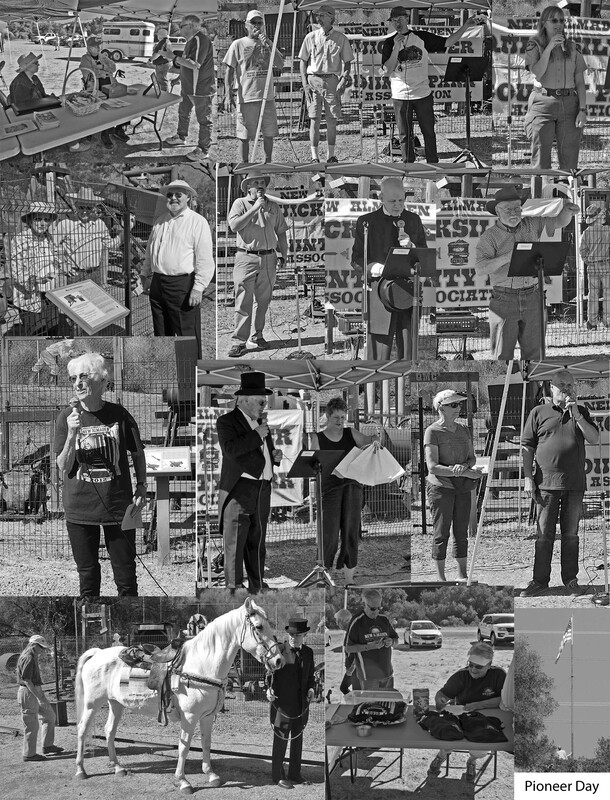 For over 34 years, NAQCPA has held their annual Pioneer Day celebration in Almaden Quicksilver County Park, in partnership with the County Parks Department. The original purpose of Pioneer Day was to be a get-together to share stories with former New Almaden miners and people who remembered the mines. While that is still the case, it has also been associated with the dedication of historic sites, interpretive signs, or projects in the park. Most of these were NAQCPA projects, or NAQCPA members were involved with them. Pioneer Day for 2018 will be held on October 13 at 11:00 am. Location TBD. See the pictures from Pioneer Day in Almaden Quicksilver's Spanishtown, Saturday October 14, 2006. Pictures from Pioneer Day, October 13, 2007, New Almaden Community Center, Santa Isabel Shafthouse Dedication. For more than 34 years, the community of New Almaden has held their New Almaden Day community celebration, kicked off by the Jump-In parade. It's an informal parade around the town, where anyone can jump in and join. Afterwards, there is a carnival held at the New Almaden Community Center, featuring games, prizes, food, and entertainment. This year's New Almaden Day and Jump-In Parade will be held on Saturday September 8, 2018, starting at 11:00 am at the New Almaden Community Center. Pictures from New Almaden Coummunity Day 9/8/07: Jump-In Parade on Bertram Road, Jump-In Parade on Almaden Road, Dedication of Pat Tillman Memorial, and the BBQ and Games at the New Almaden Community Center. New Almaden Community Day Sept. 13, 2008: Jump-In Parade, BBQ and Games. 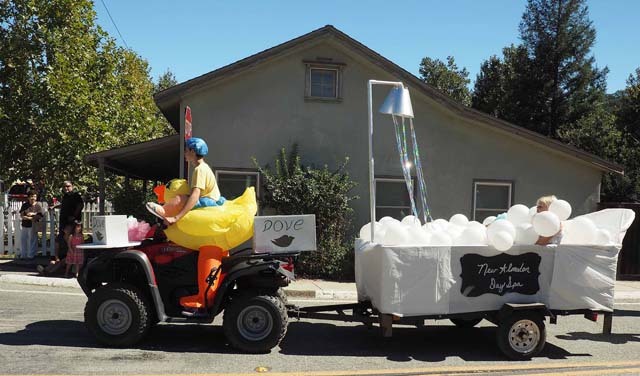 Almaden Times Weekly article on the Jump-In Parade, see Sept. 19-Oct. 2, 2014 issue, page 4. Facebook: New Almaden Day: Jump-In Parade, 9/8/18: parade preparations, the parade going north on Almaden Road, the parade returning south on Almaden Road, and the carnival after the parade at the Community Center. Almaden Times Weekly article, "Living at the mines, circa 1880-1914: Quicksilver miners worked hard, played hard"
Almaden Times Weekly article, "History Repeats Itself: Two New Almaden Historic Homes Dedicated With Monuments"
You can vote to save the Casa Grande! See here for details. 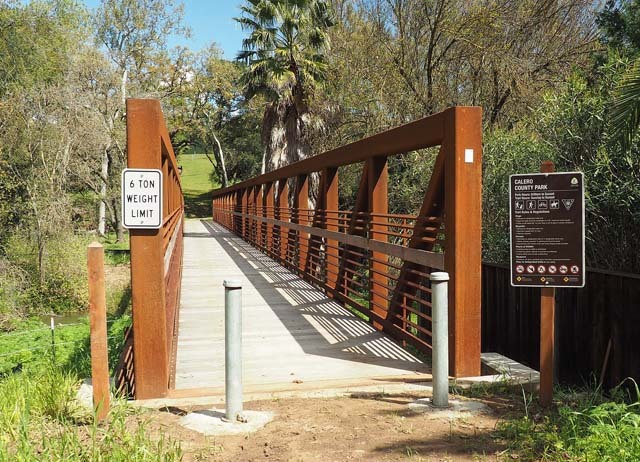 The County Parks' Healthy Trails program includes 2 trail routes in Almaden Quicksilver. NAQCPA has adopted 3 trails in Quicksilver Park: The Yellow Kid, the Great Eastern and Day Tunnel, and the Deep Gulch Trail. The trail group meets on the second Wednesday of the month and drives up to the trail for work from 9 am to 11:30 am. We need volunteers to help in the spring and summer. Contact Kitty Monahan to volunteer. San Jose Mercury News Section, Where We Live, Almaden Valley. Almaden Resident: Casa Grande in Quicksilver Park set for $5 million building restoration, March 6, 2009. 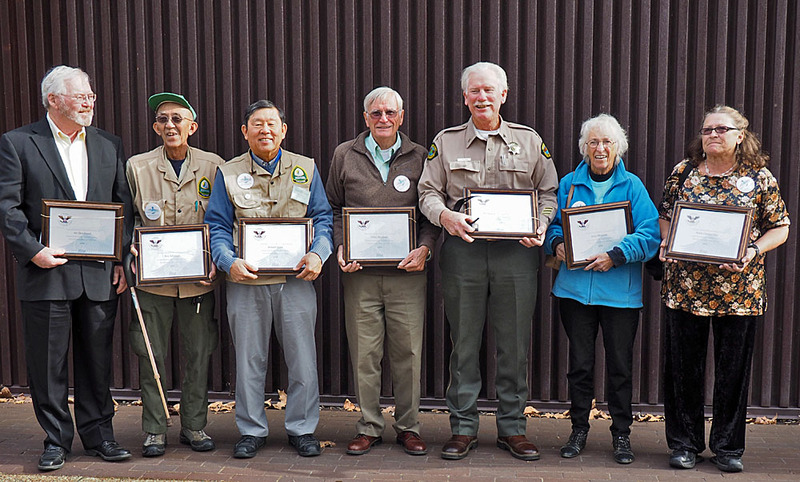 On November 18, 2014, the Santa Clara County Board of Supervisors presented the Lifetime Presidential Volunteer Service Award to County Park volunteers (here is the list). 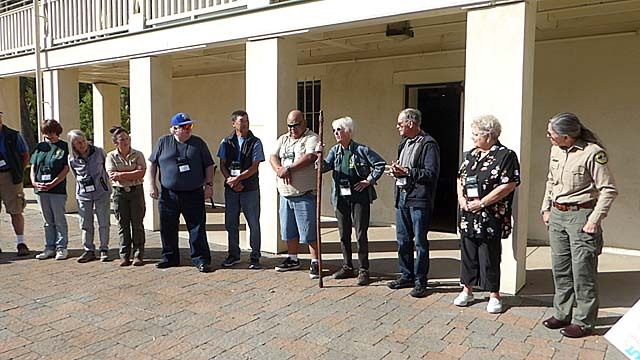 They included several NAQCPA members and officers: Kitty Monahan, Mike Boulland, Art Boudreault, Bob Meyer, and Ron Horii. Here is the commendation letter from the President. Above is a picture of some of the award winners. 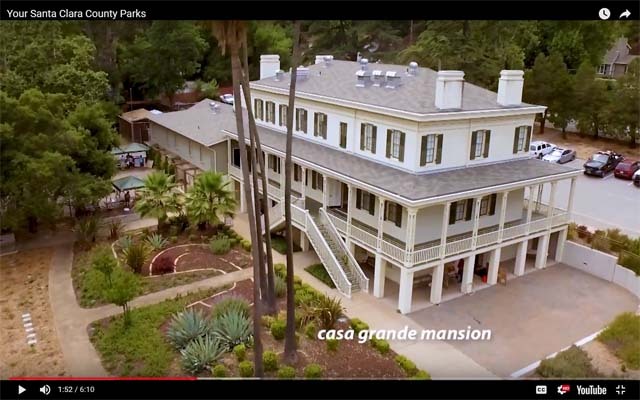 SF Gate 9/24/14: "Take a trip back in time at Almaden Quicksilver County Park"
San Jose Mercury News 3/12/15: "Almaden Quicksilver Park: Then and Now in Pictures"
An episode of Open Road on NBC Bay Area (KNTV) featured the County Parks' Park for Life Challenge. It featured contestants at the Casa Grande and Uvas Canyon. Ron Horii's pictures are shown starting at 5:40. On February 6, 2017, C-Span interviewed Luke Bailey and Kitty Monahan for a story about mining in San Jose. It was part of their 2017 Local Content Vehicles tour of San Jose, featuring the history and literary life of the community. Powerpoint presentation (18 MB) created by Ron Horii, showing activities in all the Santa Clara County Parks. Pictures from Mike Boulland's and Art Boudreault's book signing at the Casa Grande on 7/12/06. Pictures from the Los Alamitos Creek Watershed Cleanup 5/19/07: Page 1: Preparation, Page 2: Cleanup 1, Page 3: Cleanup 2, Page 4: BBQ Lunch. In September, 2011, Ron Horii had a display of park pictures at the Santa Teresa Library. See here for the County Parks' Latest Play Here Guide. See here for past events at Almaden Quicksilver and other parks. 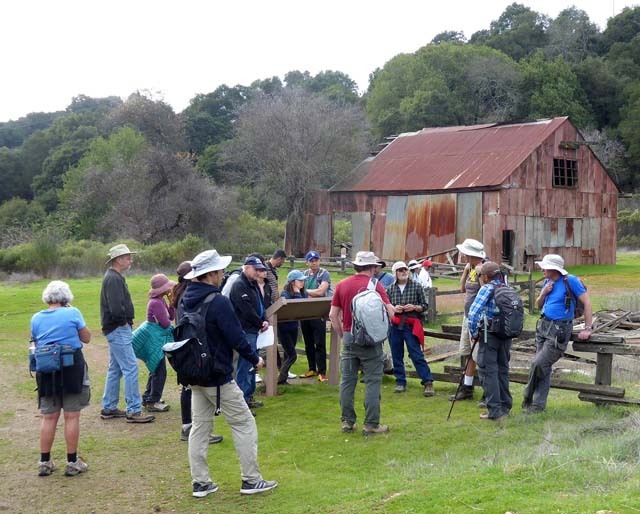 Saturday, January 19, Quicksilver History Hike, 9:00 AM - 12:00 PM, Quicksilver History Hike • Almaden Quicksilver • 9:00am-12:00pm. 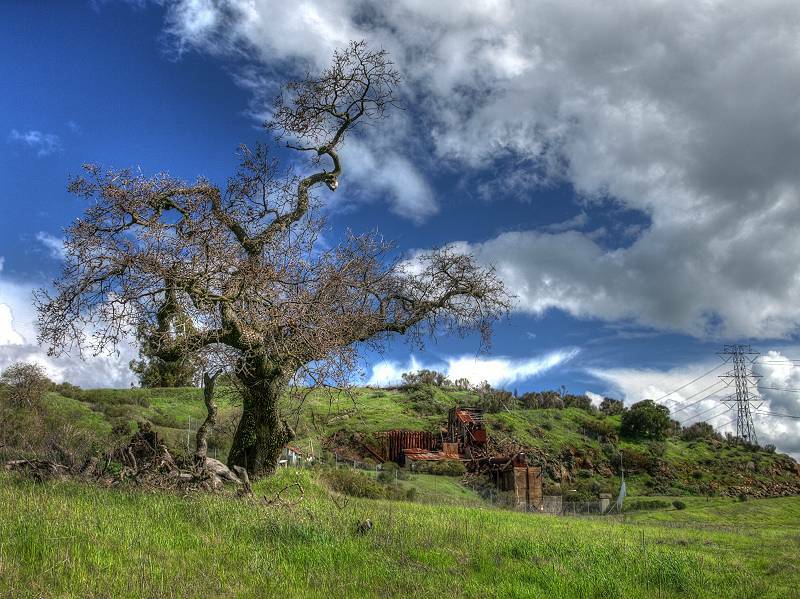 Explore what remains of the once-bustling mining operations in the hills above New Almaden on this 4-mile hike leaving from the Wood Road parking lot off Hicks Rd. Questions? (408) 918-7770. 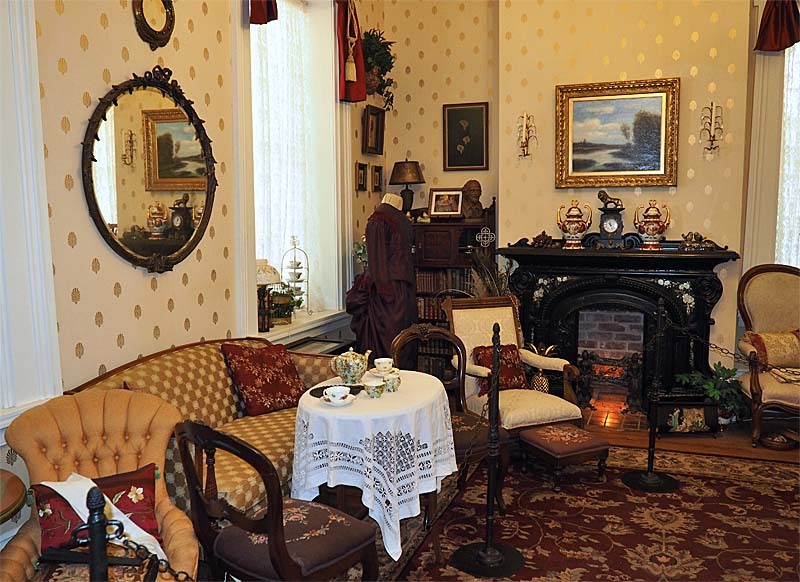 Sunday, Feburary 10, Living History Day, 12:00 PM - 03:00 PM, Experience life in a historic mining community. 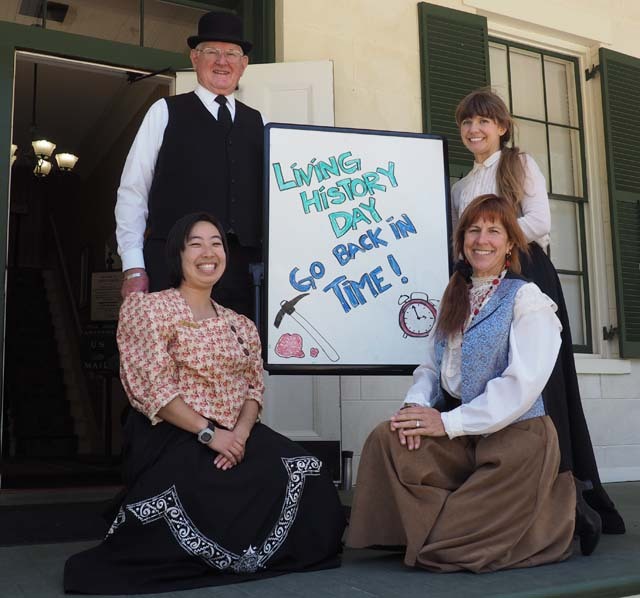 Participate in activities, play games, and learn about daily life in the 1890s at Casa Grande and the QuicksilverMuseum. History tours at 11:30am and 1:00pm. Fun for the whole family. Questions? (408) 918-7770. Saturday, February 16, Quicksilver History Hike, 9:00 AM - 12:00 PM, see January 19, 2019 above. Saturday, March 16, Quicksilver History Hike, 9:00 AM - 12:00 PM, see January 19, 2019 above. Saturday, March 30, Nature Journaling Hike, 9:00 AM - 11:00 AM, Almaden Quicksilver Hicks Rd at the Wood Rd park entrance. Enjoy a leisurely hike while learning how to nature/travel journal and create memories that will last. Bring your own sketch pad and writing implements if you have them. Bring sturdy hiking shoes, sunscreen, hat, water, and something light to sit on when we stop to sketch. Meet at the Wood Rd. lot off of Hicks Road. Reservations (408) 918-7775. Saturday, April 13, Wildflower Scavenger Hunt, Almaden Quicksilver, 12:00pm-3:00pm, Wildflower Scavenger Hunt, Almaden Quicksilver, 12:00pm-3:00pm. 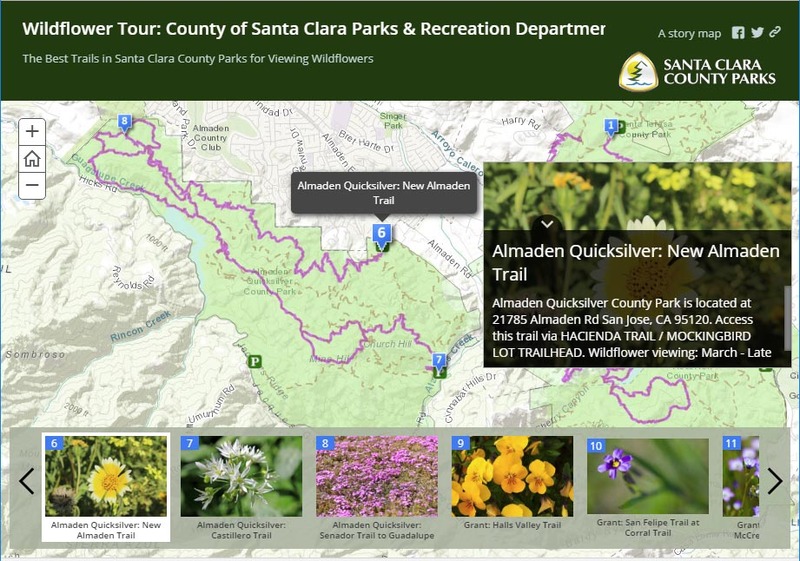 Join the New Almaden Quicksilver County Park Association on a wildflower scavenger hunt through various stations along the Wood Road Trail. Meet in the Wood Rd. parking lot off of Hicks Rd. Reservations online or at (408) 355-220​1. Saturday, April 13, 2019, Almaden Quicksilver Spring Bioblitz by Keep Coyote Creek Beautiful, 9:00 AM – 11:00 AM. Almaden Quicksilver County Park Mockingbird Hill Ln entrance. A BioBlitz is an event that focuses on finding and identifying as many species as possible in a specific area over a short period of time. At a this BioBlitz, scientists, families, students, teachers, and other community members work together to get an overall count of the plants, animals, fungi, and other organisms that live in a place. Docents will guide you and teach you to use the iNaturalist app on your smartphone or tablet to record all the living things you encounter. Flowers, trees, butterflies, dragonflies, and beetles, birds, and squirrels. Note: Heavy rain cancels this event. We'll hold the event if we have light rain, which makes the event quite fun. This event is hosted by Keep Coyote Creek Beautiful and Santa Clara County Parks. Saturday, April 20, Quicksilver History Hike, 9:00 AM - 12:00 PM, see January 19, 2019 above. 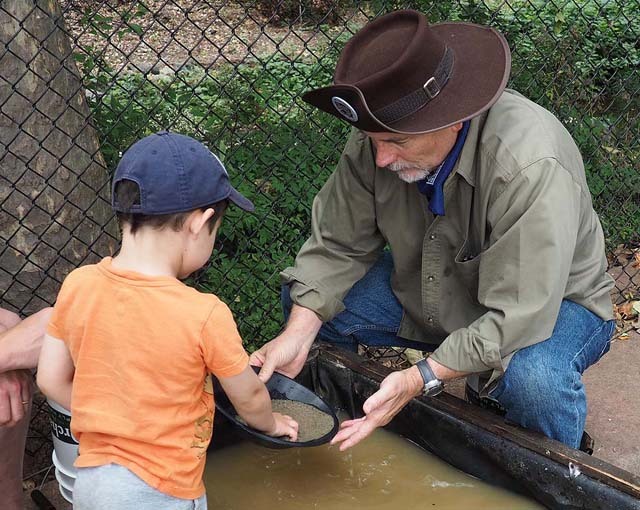 Sunday, June 16, 2019, Take a Ride With a Ranger, 9:00 AM - 12:00 PM, Almaden Quicksilver Hacienda Entrance: Learn bike handling skills, bike safety and trail etiquette, all while you learn about the mining history of Almaden Quicksilver Park. Questions? (408) 535-4070. 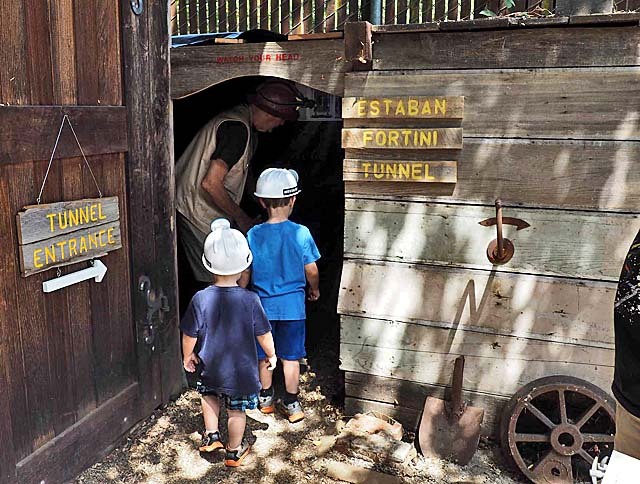 Saturday, August 3, 2019, Play Like A Miner, 11:00 AM - 03:00 PM, Almaden Quicksilver Mining Museum. Ever wondered what it was like to be a miner long ago? Come join in for a fun day of learning through games, demonstrations and crafts. Try your luck at panning for gold and precious gems. A fun event for the whole family! Questions? (408) 918-7770. Sunday, August 4, 2019, What's in a Ranger's Truck, 2:00 PM - 03:00 PM, Almaden Quicksilver-Mockingbird Hill Park Entrance. Have you ever wanted to see the inside of a Park Ranger's truck? This is your chance to interact with a variety of equipment used for search and rescue, firefighting and lifesaving duties. Meet at the Mockingbird Hill entrance. Questions? (408) 268-3883. Saturday, September 14, 2019. New Almaden Day Jump-In Parade. Saturday, October 12, 2019, Pioneer Day. Details TBD. From the Rancho San Vicente Hike, 3/28/15 These events are mostly at neighboring parks, like Santa Teresa, Calero, and Hellyer. See here for Santa Clara Open Space Authority events. Friday, January 18, 2019, Lunar New Year Night Hike • Santa Teresa • 6pm-8pm. The moon brings people from all over the planet together for celebrations. Join us for a reflective night hike celebrating the moon in each of our lives.Recommended 9+ years. Meet at the chicken coop with a large mouth cup and water or tea. Reservations (408) 226-5453. Saturday and Sunday March 2-3, 2019, 9:00 am to 12:00 pm. Cleanup event at the Curie Drive property in Santa Teresa Park. Meeting location is the Bear Tree Lot at Santa Teresa County Park located across from the address 279 Curie Dr., San Jose, CA 95119. Here is the flyer for the event. Sign up here on Samaritan. Wednesday, March 27, 2019, 10:00am-1:00pm, Coyote Valley Open Space Preserve. 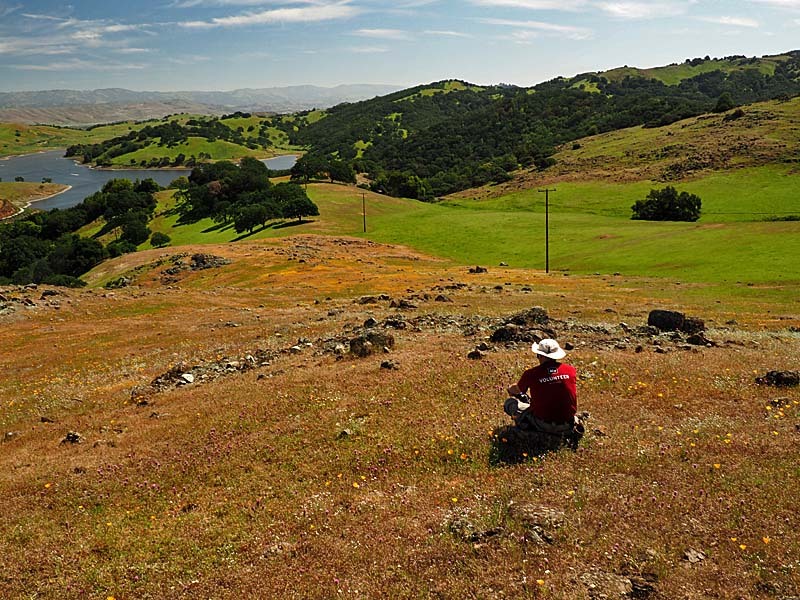 Join docent Ron Horii as he takes us on a tour of Coyote Valley Open Space Preserve. Discover and explore this beautiful preserve with a knowledgeable docent who will talk about the plants and wildlife found here. The hike will be 4 miles long and moderately strenuous with several uphill grades. Along the hike, you will see oak woodlands as well as grasslands. The trail may be muddy, rocky and uneven in some areas, so sturdy shoes are advised. Bring water, lunch or snack, a camera, sunscreen, a hat and your sense of adventure! There are restrooms in the parking lot but none on the trail. Meet at the Centennial Recreation Senior Center, 171 W. Edmundson Ave, Morgan Hill, CA 95037. We will caravan to the site. 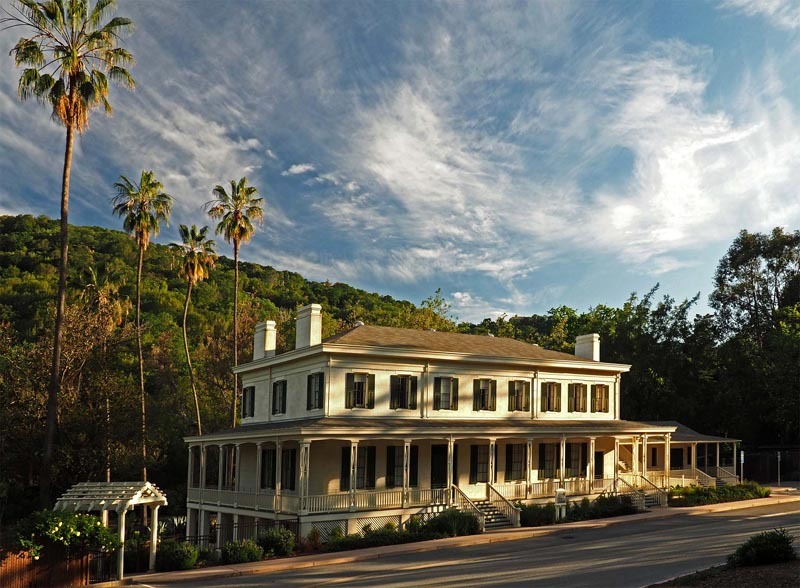 Thursday, April 4, 2019, 7:00 pm at the Santa Teresa Golf Course Upper Clubhouse: A Taste of Santa Teresa History 2019 Speaker Series. Ranger Lisa Pappanastos will talk about the Grant Ranch and the Bernal Connection. Saturday, April 6, 2019, County Parks Volunteers Picnic, 12 pm to 3 pm, Martial Cottle Park, Edward Cottle Group Area. County Parks volunteers will receive an invitation to this recognition event. Saturday, April 6, 2019 at 9 AM – 11 AM, Hellyer County Park - Cottonwood Lake. If you love birds, this walk is for you! Join us for a walk at Hellyer Park's Cottonwood Lake area with bird enthusiasts Alie and Bruce Victorine. You'll enjoy the fresh air of the park in winter, and see some local as well as seasonal birds. Plus the plants will be leafing and flowering, so our native plant advocate Pat Pizzo will be happy to share his enthusiasm with you. And, the local ranger will round out the walk. Free and accessible. Fee for parking. Saturday, April 13, Spring Celebration • Martial Cottle • 10:00am-3:00pm. Celebrate the spring planting season and our shared connection to Santa Clara Valley's agricultural past, present and future. Enjoy kids' farm activities, shop for plants, take a gardening workshop or go on a farm tour. Event volunteers needed! Questions? (408) 535-4060. Saturday April 27, Introduction to Outdoor Photography, Santa Teresa Park's Bernal-Gulnac-Joice Ranch, Manila Dr. at Camino Verde Dr., San Jose 95119 from 10 am to 1 pm. Join Docent Ron Horii for a free outdoor photography workshop for all experience levels and learn about the types of cameras and how to choose and use them, how to take outdoor pictures, photo composition, lighting. Afterwards, go for a hike up into the wildflower-covered hills and take pictures. Call (408) 355-2240 for reservations or visit www.parkhere.org for online reservations. Sunday, April 28, 2019, Hellyer County Park Spring 2019 Bioblitz by Keep Coyote Creek Beautiful, 9:00 AM – 11:00 AM. Hellyer County Park 985 Hellyer Avenue Cottonwood Lake - Southwest trail entrance. A BioBlitz is an event that focuses on finding and identifying as many species as possible in a specific area over a short period of time. At a this BioBlitz, scientists, families, students, teachers, and other community members work together to get an overall count of the plants, animals, fungi, and other organisms that live in a place. Docents will guide you and teach you to use the iNaturalist app on your smartphone or tablet to record all the living things you encounter. Flowers, trees, butterflies, dragonflies, and beetles, birds, and squirrels. Note: Heavy rain cancels this event. We'll hold the event if we have light rain, which makes the event quite fun.This event is hosted by Keep Coyote Creek Beautiful and Santa Clara County Parks. Saturday, June 15, 2019, In The Park After Dark Movie Night, 8:45 PM - 10:30 PM, Santa Teresa. Enjoy a FREE feature-length movie under the stars with family and friends. Come early to learn about the park and talk to a Ranger. Meet in the Pueblo Group Area parking lot with a chair or blanket, flashlight and snacks. No dogs please. Questions? (408) 225-0225. Friday, June 21, 2019, In The Park After Dark Movie Night, 8:45 PM - 10:30 PM, Martial Cottle Park. Enjoy a FREE feature-length movie under the stars with family and friends. Come early to learn about the park and talk to a Ranger. Meet on the lawn with a chair or blanket, flashlight and snacks. No dogs please. Questions? (408) 535-4060. Saturday, June 22, 2019, Intro to Fishing for Kids, 8:30 AM - 10:30 AM, Hellyer County Park Visitor Center. Learn to fish from a Park Ranger! Explore the Coyote Creek waterway and discover how you can be a steward for our watersheds. Meet at the Visitor Center. Fishing equipment provided or bring your own. Reservations (408) 225-0225. Saturday, June 29, 2019, What's "Shaking" in Parks? 9:00 AM - 11:00 AM, Santa Teresa Park Pueblo Day Use Area. Trek to the highest peak in the park to view fantastic vistas and explore local geology formations. Meet in 2nd parking lot (on left by yellow call box) with hiking shoes, layered clothing and water. Questions? (408) 225-0225. Saturday, June 29, 2019, Chitactac Family Day, 11:00 AM - 02:00 PM, Chitactac-Adams County Park. Celebrate the culture and heritage of the Amah Mutsun people who once lived at this ancient village site. Participate in hands-on activities, play traditional games and make unique crafts. This event is free and appropriate for families and all ages. Questions? (408) 918-7770. Friday, July 12, 2019 to Saturday 13, 2019, Movie Night Campout, 7:00 PM - 08:00 AM, Santa Teresa Pueblo Day Use Area. Join us for a family-friendly movie and overnight campout in the park. The evening begins with a feature-length movie under the stars, followed by a campfire and 2nd movie. Bring your own tents, chairs, bedding and food. $15 fee for each tent or RV and $6 per vehicle. Fee collected upon arrival. No dogs please. Reservations (408) 535-4060. Friday, July 12, 2019, In The Park After Dark Movie Night, 8:45 PM - 10:30 PM, Santa Teresa Pueblo Day Use Area. Enjoy a FREE feature-length movie under the stars with family and friends. Come early to learn about the park and talk to a Ranger. Meet in the Pueblo Group Area parking lot with a chair or blanket, flashlight and snacks. No dogs please. Questions? (408) 225-0225. Sunday, July 13, 2019, Oak Trees! What are they good for? 10:00 AM - 11:00 AM, Martial Cottle Park. Enjoy a leisurely stroll to see and celebrate the park's majestic heritage oak trees. Meet at the Visitor Center. Questions? (408) 535-4062. Saturday, August 3, 2019, Light Life Night Hike, 8:00 PM - 10:00 PM, Santa Teresa. This moderate 2-mile night hike will investigate the role of light in the life cycles of animals and humans. Bring a flashlight. Meet at the top of Bernal Rd, parking lot on left before IBM gate (GPS coordinates: 37.214513, -121.796560?). Reservations (408) 226-5453. Sunday, August 4 and August 18, 2019, What's "Shaking" in Parks? 9:00 AM - 11:00 AM, Santa Teresa Park Pueblo Day Use Area. See 6/29/19 above. Saturday, August 10, 2019 to Sunday, August 11, 2019, Movie Night Campout, 7:00 PM - 08:00 AM, Santa Teresa Pueblo Day Use Area. See 7/12/19 above. Saturday, August 10, 2019, In The Park After Dark Movie Night, 8:30 PM - 10:30 PM, Santa Teresa Pueblo Day Use Area. See 7/12/19 above. Saturday, August 24, 2019, The Impact of Fire, 9:00 AM - 11:00 AM, Santa Teresa. Take a 2-mile walk with park staff through the site of 2018’s Curie Fire while exploring our community’s relationship with wildfire in the 21st-century. Young adults encouraged to attend. Minimum age 12. Bring water and sun protection. Meet at the Bernal Ranch on Manila Drive. Questions? (408) 918-7779. Saturday, August 31, 2019, A Taste of Archery, 8:00 AM - 10:00 AM, 10:30 AM - 12:30 PM, Santa Teresa Archery Range. Join the Black Mountain Bowmen to learn how to shoot a compound or recurve bow, fletch arrows and make a bow string. Ages 6 and up with parent. A mandatory safety class and equipment are provided by Predator's Archery. Reservations online or (408) 355-2240. Saturday, September 21, 2019, The Impact of Fire, 9:00 AM - 11:00 AM, Santa Teresa. See 8/24/19.